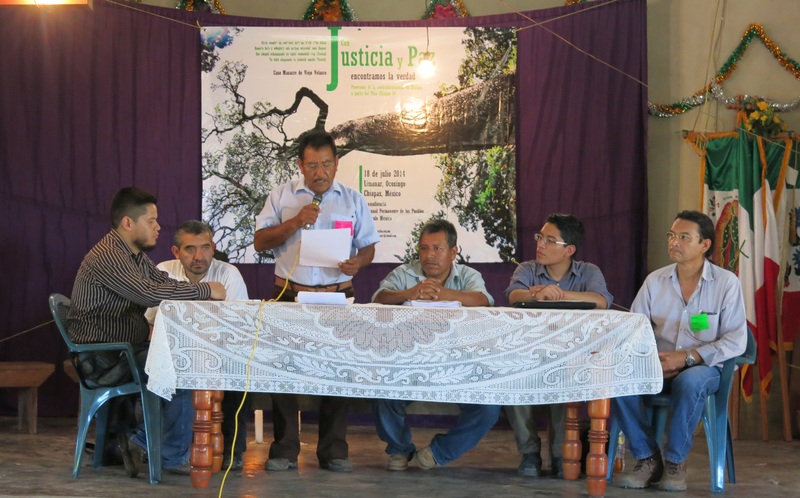 On 18 July in El Limonar, Ocosingo municipality, there was held the pre-audience for the People’s Permanent Tribunal (TPP), “With Justice and Peace We Shall Find Truth.” As part of the work on “Dirty War as violence, impunity, and lack of access to justice” covered by the Mexican chapter of the TPP, the Viejo Velasco massacre was addressed. This atrocity, which took place on 13 November 2006, resulted in the execution of four persons and the disappearance of four others. Two of the disappeared were found dead some months later. Furthermore, 37 residents of the community were forcibly displace, seeking refuge in the neighboring community of Nuevo Tila. After having reviewed the relevant documents and the declarations of victims and witnesses, the judges declared that the “The fact that these acts of violence from the State did not solely target combatants but also the civilian, non-combatant population–including boys and girls–shows that the only common factor among the victims was that they pertained to certain ethnic groups and social organizations. It also shows that said acts were committed ‘with the intention of destroying’ these groups ‘totally or in part,’ thus qualifying these as crimes against humanity.” For this reason, they judged the Mexican State to be culpable of having violated the rights to life and personal integrity as well as the right not to experience forced disappearance in the cases of Viejo Velasco and Acteal in the Northern Zone of Chiapas. In conclusion, the tribunal declared that “the State must use the appropriate means to observe its obligation to investigate the acts that have been denouned, as well as to identify, judge, and sanction those responsible and the beneficiaries of these crimes.” It stressed that “the Mexican State is obliged to comprehensively compensate the damages caused by these crimes against humanity.” Lastly, it recalled that the cycle of the Mexican chapter of the TPP will end in November 2014, a time in which the “grave human-rights violations committed by the Mexican State that to date enjoy impunity” will be denounced and made visible before the national and international public. This entry was posted on Sunday, July 27th, 2014 at 9:02 pm and is filed under Chiapas, Disappeared, Human Rights, Human Rights Defenders, Indigenous people, Justice system, Land and Territory, Land rights, Las Abejas, Mexico, Militarization, torture, Women, Youth. You can follow any responses to this entry through the RSS 2.0 feed. You can leave a response, or trackback from your own site.